Giampaolo Tonello visited Meiringen air base in Switzerland at the time of the 'wiederhohlungskurses'. Switzerland is probably the most exciting country for military aviation photographers for its great photo opportunities and stunning backgrounds. 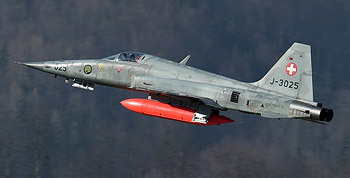 Meiringen air base, located in a narrow valley near Brienz in the center of Switzerland, is probably the best place to go, especially during the evaluation exercises (wiederhohlungskurses) which were held this year from March 12 up to March 30. The wiederhohlungskurses are intensive training excercises during which flying activity increases a lot from normal standards. Meiringen hosts the Fliegerstaffel 8 flying the old but always fascinating F-5E/F and the Fliegerstaffel 11 with their F/A-18C/D. One of the many reason to go there is that in Meiringen the caverns (big hangars in the mountain sides) are still used and the aircraft can be seen crossing the town road when taxiing to or from the runway. Surely, one of the most unusual and funny things to see. This allows you to get very close to the action and take very nice shots. On March 15 we went there and Meiringen did not disappoint us. Lots of Tigers and Hornets flew many missions (some of them four sorties on that day!!) and we had the opportunity to photograph them in different ways. A big surprise was also the new specially painted Hornet J-5011 sporting the new tiger tail. The guys from Fliegerstaffel 11 did a very nice job!